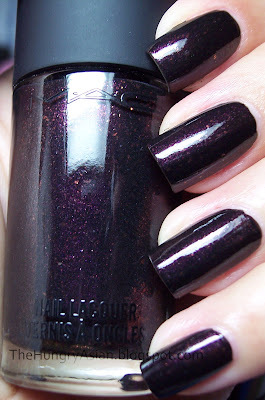 MAC Baby Goth Girl outdoors, 2 coats with Seche Vite. Blackened purple shimmer with flakies. I got some good shots this time of the shimmer, it is purple, red and pink. Here is a good indoors shot that accurately depicts this shade 99% of the time. P.S. I bought two bottles of these so will be giving one away soon! Wow this is a super pretty color, very nice for fall. You should go back and get Seriously Hip lol bloggers are such enablers! I have a Nordstrom gift card and I want to get some MAC polishes too. This is so beautiful! I love purple shimmers. That is a gorgeous color! I wish that my MAC wasn't sold out of them already! looks awesome! YES you need to go back to get seriously hip dude, like immmmedddiatelyyy if not sooner :D you will NOT regret it. i am LOVING it! you did get some great shots of this polish!! 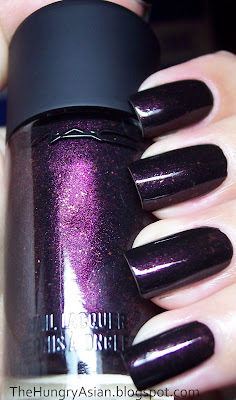 This one looks so nice on you, love the shimmer! Yes you should go back so you'll have one of each. I look forward to the possibility of a give-a-way. :-) That purple shade is soooo pretty on you. seriously hi is a dupe for wagon trail. Your pics make me want to wear BGG, it is such a beauty! This is gorgeous! I was wondering what that looked like. I'd love to see the other. You can go back and get the other since I'd like to see that also. I can enable to can't I! Your nails look gorgeous. Love the shimmer of this. I also saw some eyeshadow that looked pretty also. I have to check it out. I have a confession: it's the first mac polish that I WANT. it's so cool! Thanks for swatching this! It looks fantastic on you :) This is the only one I ordered because I figured that Seriously Hip was a dupe of Wagon Trail or Dark Knight. Hi! That's ok you are super busy with school I hope you are doing great! Thank you :) Well I'm gonna give one away so maybe you will win! Thanks! I must admit it is very dark in person and barely visable shimmer. Wow yours sold out already, wonder if I'm too late to get seriously hip at my counter lol.. Thank you, me too I love it. It's too bad you can't see it most of the time. Hah maybe I will! I don't have anything else to giveaway at the moment so that's why I'm waiting but I dunno what else to get. Haha yes, you enabler! 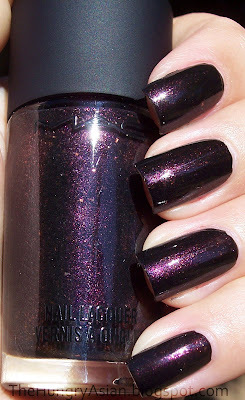 I love the shimmer too, it's just most of the time it looks black like so many polishes like this out there. These two look amazing on you, I have no MAC nail polish at all I might just go and get some after seeing how lovely they are on your nails! Hi, I follow via google connect. Your nails are perfect!